Look back - Leaning Forward! September 25, 2014 until… September 13, 2015. While many assume when God created the Sun and the Moon that He did so for light, heat, gravity, and other natural mechanisms, when looking at Genesis 1:14, we learn of four other purposes behind why the lights in the heavens were created and placed where they are. The Bible says these are for "signs," "seasons," "days," and "years." The Hebrew word for "signs" in this context is owth, a word meaning a "miraculous sign," "omen," or "warning." It signifies, among other things, that God created the heavenly bodies to communicate important matters at particular times to His covenant people. The next reason God created the sun and the moon is for "seasons." Again, in our Western mindset, we figure God is talking about… winter, spring, summer, and autumn (fall). This is the farthest from the truth. In Hebrew, the word here is "mow’ed" and is accurately translated as "an appointed time" or "divine appointment" especially related to "sacred seasons" or Feast days. This same Hebrew word is translated into English in Leviticus 23 as "feast" where it talks about the "Feasts of the Lord." At first, these two words; "appointments" and "feasts" seem about as far apart as you can get. This is why one needs to keep the Hebrew language in perspective so as not to miss the deeper conveyances of this text. The word "mow’ed" implies that God has a "day timer" or "calendar" on which He keeps predetermined "appointments" with human history and that are connected with "His Feasts or Holy Days." God the Father knew the year, the month, the day, and the exact time His Son, Yeshua (Jesus) would die and how this event would be played out in fulfilment of the Levitical feasts of Israel. Finally, God declares that the sun and the moon were created to determine "days and years." Obviously, this has nothing to do with our modern Gregorian calendar, which was created by a pagan Roman ruler and is based on the sun. The Muslim calendar is based on the moon. But the Biblical calendar… the one that God uses according to Genesis is based on the sun and the moon. So when the Scripture refers to "days and years" in Genesis 1:14, it is pointing to "Biblical days and years" or "holy days" as well as Shemitah years and Jubilee years (every seventh year the land in Israel was to rest). Leviticus 25 promises bountiful harvests to those who observe the Shemitah, and describes its observance as a test of religious faith. The Hebrew people count and observe 7 year cycles. Every cycle would fulfill a "Sabbatical Year known as a "Shemitah" or "Shmitah" and means, "to release!" “At the end of every seven years you shall grant a release. And this is the manner of the release: every creditor shall release what he has lent to his neighbour. He shall not exact it of his neighbour, his brother, because the LORD’S RELEASE has been proclaimed….” Deuteronomy 15:1-4 Reading this Scripture further promises… many blessings! What happened in the last two Shemitah years…? The Shemitah year of 2001… America was attacked by radical Islamic terrorists killing nearly three thousand people on 9/11 and this sad day became America's new day of… discredit and humiliation! The Shemitah year of 2008… America experienced a stock market crash on September 29 when the market fell 777 points in one day. It was the greatest one-day decline in the history of Wall Street. All this happening on the 29th of Elul which is the day preceding the 7th month (Tishri) on the Hebrew calendar, in the 7th year of the Jewish Shemitah, on the 7 year anniversary of the previous record Dow drop which also happened on the 29th of Elul on the Hebrew calendar, (the day before the 7th month) on the previous 7 year Jewish Shemitah. Just as the crash of the stock markets of 2008 was also the aftershock of 9/11 the extended after-shock correlated with Isaiah 9:10. And, these two events were tied together impossible to unravel… 7 years apart! This too goes deeper still. The Biblical Year isn’t based on the Western Gregorian calendar but on the Hebrew Lunar calendar. So the 7 year cycle of the Shemitah has to be based not on the Western year but on the Hebrew year... So no matter what date it is on the Western calendar the Shemitah will always end on the 29th day of Elul of the Hebrew calendar and in 2008 it fell exactly on September 29th the day of the crash. But, in other years the same day in the Biblical calendar would fall on a different day in the Western calendar. The two greatest stock-market crashes America had ever know, both taking place on the exact Biblical day separated by the exact period of time ordained in the Bible… 7 years to the day… both occurring on the one Biblical day appointed for the wiping out of credit and debt! Coincidence…? We don’t think so… the odds of the events happening over the past 11 years the way that they did without God’s hand being behind it is astronomical. That whole 777 number stuck out since out of all the numbers on the planet to fall, it happened to be that one? So this “Shemitah” must mean something! How are we going to know the signs and seasons of His return or what He expects from us without studying His days? It surely was a message from God. The Shabbat (Sabbath)… is the foundation of all other Hebrew festivals. God said that the Sabbath was to be a holy day. This simply means a day that is set apart or different from other days. It was set apart as a day of rest. The Blood Moon Tetrad of 2014 / 2015 coincides with the beginning of the “Shemitah” as well a “Jubilee Year”… which begins this coming Yom Kippur. A Jubilee (50th) year comes after 7 sabbatical cycles of 7 years and is more amazing that a Jubilee convergence with the “Four Blood Moon” all happening together…! So then what is a Jubilee Year…? By adding together seven cycles of seven years, we count a total of 49 years. Therefore, the year of Jubilee is the 50th year as noted by the following verses… “You are also to count off seven Sabbaths of years for yourself, seven times seven years, so that you have the time of the seven Sabbaths of years, namely, forty-nine years. You shall then sound a ram’s horn abroad on the tenth day of the seventh month; on the Day of Atonement (Yom Kippur) you shall sound a horn all through your land. You shall thus consecrate the fiftieth year and proclaim a release through the land to all its inhabitants. It shall be a jubilee for you, and each of you shall return to his own property, and each of you shall return to his family,” Leviticus. 25:8-10. The English word “jubilee” comes from the Hebrew word “yovel” meaning a “trumpet or ram’s horn.” These rams’ horns were blown on the Day of Atonement to announce the start of the year of jubilee... The word jubilee should not be confused with the word jubilation which comes from a Latin word meaning to rejoice. The year of jubilee was no doubt a time of great jubilation, but the similarities of the two words are (at least humanly speaking) a coincidence. For many years before the Exodus, the Israelites had been slaves in the land of Egypt, without freedom and without possessions. When they reached the land of Canaan, Joshua divided the land among their tribes and their families… so that each had his own inheritance. Every adult male among them became a land owner. This land was a permanent possession that could never depart from his family. If a man became poor he could sell part or all of his land… but only temporarily. It would always revert to him or his descendants at the “Year of Jubilee.” If he became even poorer and was unable to pay his debts, he could sell himself into slavery, and work to pay off his debts. Again that slavery could only ever be temporary. When the great “Day of Atonement” in the “Year of Jubilee” came he became a free man once again and repossessed his inheritance. 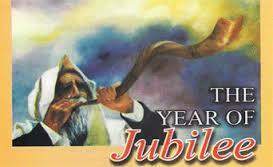 The most unusual observance that God commanded the Israelites through Moses was… the keeping of the Year of Jubilee. For most people this celebration occurred only once in their life time and for many not even that, as it occurred …only once every 50 years. At this year of jubilee all Israelites who had sold themselves into slavery were set free… and all land that had been sold reverted to its original owner. This meant that the Israelites could not ever be in permanent slavery; nor could any Israelite permanently lose his inheritance! The famous story of Joshua commanding the sun to stand still in Joshua 10:13 the moon is said to “stand” or “wait.” Does this mean that the earth stopped revolving? Scientists say that this would tear the earth apart! In ancient times the moon is said “to not wait” for the sun when it sets below the horizon before the sun rises. When the moon and sun are seen together then the moon is said “to wait” or “stand” for the sun. When the moon is said “to stand” it means the moon is not on the horizon but further up in the sky. (Institute for Biblical & Scientific studies; Ibid, 185) Joshua 10 seems to indicate that it was the 15th day of the month which was a bad omen of destruction… for Joshua’s enemies! The more important question is how the people at Joshua’s time understood this? In Acts 2:20 the moon is turned "into blood." Does this mean the moon turned into real blood? No! It is used figuratively of a lunar eclipse when the moon turns a dull red colour, sometimes when the moon is close to the horizon the atmosphere causes the moon to look orange-red in colour, or clouds or smoke can darken the moon. Lawson Younger in his book Ancient Conquest Accounts has some very interesting comparisons of Joshua 10 with other ancient Assyrian, Hittite, and Egyptian conquest accounts. Being able to conquer the enemy in a single day is a great victory in ancient times. One implored his god to maintain daylight long enough for their enemies to be defeated. The supernatural aid of the god in battle with hailstones is also told. 1. "When the day is long according to its calculation, there will be a long reign. The day is calculated to last as long as the Sun remains above the horizon." When a month has 30 days, its days are said to have their full or proper length. 3. "When the sun stands within the "halo of the Moon," (also called a moon ring or winter halo) in all lands they will speak truth." (Rain…?) There’s an old weather saying even today… "Ring around the moon means an approaching storm and rain soon!" There’s truth to this saying, because high cirrus clouds often come before a storm. 5. "When the Sun stands in the place of the Moon, the king of the land will be secure on his throne." (Israel defeated its enemies!) This is a comparison of Joshua 10:13 and the Lord’s Crucifixion (Luke 23:44-47). 6. "If in Adar (Adar is the 12th month of the Hebrew year. Corresponds to February or March on the Gregorian calendar) the sun stands still in the middle of noontime: the land will experience siege (and) misery." These reports show us that terms like "The sun or moon stood still" were commonly used to describe certain conditions of heavenly bodies that they observed. It does not mean the earth stopped rotating. 7. Another important point is one of the most important calculations in ancient times was the full moon in the middle of the month. The first day of a full moon was when the moon set minutes after sunrise, so that the sun and moon were both visible on opposite horizons. If this was on the 14th, it was a good omen but if on the 15th, it was a bad omen. It says that if "on the fourteenth day the Moon was seen with the Sun. There will be an overthrowing of fortresses and downfall of garrisons (a group of troops stationed in a fortress or town to defend it!)" The Prophecy of Jubilees by Rabbi Judah Ben Samuel… Ludwig Schneider of Israel Today magazine has translated Judah Ben Samuel (1140-1217) work into English. "...According to this article, Rabbi Judah Ben Samuel was a top Talmudic scholar in Germany. Just before he died in the year 1217 he prophesied that the Ottoman Turks would rule over the holy city of Jerusalem for eight jubilees. That is 400 years (8 x 50). The Ottoman Turks did take control of Jerusalem 300 years after the Rabbi’s death in 1517 and as according to the prophecy, the Ottoman Turks then lost Jerusalem 400 years later in 1917. It was during WWI that British General Edmund Allenby walked into Jerusalem on Hanukkah without firing a shot in 1917. The timing of this with the holiday and the ease at which it occurred indeed make this moment of history extremely significant... The Rabbi then went on to say that after the eight jubilees, the ninth jubilee would have Jerusalem being a no-man’s-land, which it was from 1917 to 1967 until the Six-Day-War. The Rabbi’s prophecy then stated that in the tenth Jubilee that Jerusalem would be controlled by Israel and then the Messianic end times would begin. That would then bring the time to 2017." Very interesting…! The "Jubilee" (Jovel) "Shemitah Year for Jerusalem… Numerous prophecies centre on Jerusalem. It was foretold that Jerusalem would be conquered by Gentiles: "Jerusalem shall be trodden down of the Gentiles, until the times of the Gentiles be fulfilled," Luke 21:24. This prophecy was given by Yeshua (Jesus) and started to come to pass in 70 AD when Jerusalem was conquered by the Romans and all the Jews were either killed, died of starvation, or were sold into slavery. In 638 AD, the Muslims conquered Jerusalem and, apart from a brief interval by the Crusaders, held it until 1917 when the Allied Forces under General Allenby delivered the city. The Prophecy of Jerusalem's Deliverance in 1917… The prophet Daniel, speaking about the future of his hometown Jerusalem, gave the following remarkable prophecy: "Blessed is he that waits, and comes to the thousand three hundred and five and thirty days…" Daniel 12:4-12. The year 1335 corresponds to the year 1917, the exact year when the Turks handed over the City of Jerusalem to the British. The prophet Haggai even prophesied the exact day of the deliverance… the 9th of December (Haggai 2:15-18), and Isaiah foretold the manner in which Jerusalem would be with the help of airplanes (Isaiah 31:5). The Prophecy of Jerusalem's Deliverance in 1967… Ever since the foundation of the state of Israel in 1948, the Arab nations have refused to accept Israel as an independent state and were waiting to defeat Israel. In spite of catching the Israelis off guard by attacking them on a Sabbath day in June, 1967, and in spite of out-numbering them by at least 50 to 1, the Arabs suffered complete defeat in just six days. In less than three hours the Israeli air force destroyed 300 Egyptian aircraft on the ground. But, the most significant fact of the war was that the Old City of Jerusalem, which was until then in the hands of Jordan, came back into Jewish possession. Thus, once again, amazing Bible prophecies were fulfilled. As unlikely as it was, many Christians were not taken by surprise by the outcome of the Six Day War. Two different prophecies pointed to the year 1967 for the deliverance of Jerusalem; Daniel’s 2,300 Year Prophecy; "How long shall be the vision concerning the daily sacrifice, and the transgression of desolation, to give both the sanctuary and the host to be trodden under foot? And he said unto me, unto two thousand and three hundred days; then shall the sanctuary be cleansed," Daniel 8:13-14. Reading the context this prophecy was given in, it speaks about a ram with two horns (Media and Persia; Daniel 8:20, and a rough goat, Greece; Daniel 8:21). "And I saw him (the goat) come close unto the ram, and he was moved with choler against him, and smote the ram, and brake his two horns: and there was no power in the ram to stand before him, but he cast him down to the ground, and stamped upon him: and there was none that could deliver the ram out of his hand," Daniel 8:7. This part of the prophecy was fulfilled when Alexander the Great, with an army of 35,000 Greeks and Macedonians, crossed the Dardanelles into Asia Minor in 334 BC and defeated the vast Persian Empire. From that time on, Israel would always be "trodden down by Gentiles," or under the control of foreign nations. However, Daniel prophesied that the sanctuary (Jerusalem) would be trodden down only for 2,300 days. Applying the Biblical time scale; one day = one year; Ezekiel 4:6, and bearing in mind that there is no date 0 AD, we arrive exactly at 1967! The year of Jubilee (Leviticus 25:10) was marked by the fact that all the properties and possessions were given back to their original owners, should they have lost them in the meantime. Slaves would be set free; in short, it was a time to "proclaim liberty." Calculating from the year 1917, the next year of Jubilee was to be 1967! Is it mere coincidence that Jerusalem was again delivered in that year? IF we are starting from the Capture of Jerusalem in 1967 making 1966 the 49th year 1 Jubilee thereafter = (7 counts of 7 Years = 49 YEARS): 1966 + 7 + 7 + 7 + 7 + 7 + 7 + 7 = 2015 (1973 1980 1987 1994 2001 2008 2015). Since AD 70, Old Jerusalem had not been under Jewish sovereignty until 1967. The liberation of Jerusalem on June 7, 1967 is the key pivotal point in modern history related to the Bible prophecy and the End Times. Yeshua (Jesus) indicated in Matthew 24:32-34 that there would be a time when the "fig tree" (Judah / the Jews), would bring forth leaves… and that this generation should see the return of Christ. We are presently living in that time! The founding of the State of Israel in 1948 and the deliverance of Jerusalem in 1917 and 1967 are all signs of the fig tree putting forth leaves. Yeshua (Jesus) will indeed return soon, intervening in the coming final nuclear war and establishing His kingdom on earth which will exist for a thousand years. The signs can already be seen. Are you ready? The number 70 is a prophetic number. Daniel the prophet spoke of 70 sevens that must be fulfilled in order for redemption to come. The 70th Jubilee Shemitah of "2015" is extra significant! 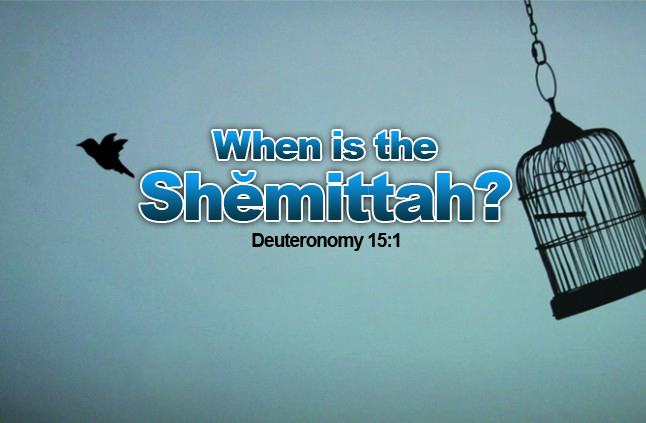 This Jubilee Shemitah of 2015 will mark the beginning of a prophetic series of events that could ultimately culminate seven Years later… at the SECOND COMING of Christ (however only God knows the time and date) when ALL real estate of the planet will be returned to its original owner, the Creator, the ULTIMATE manifestation of the Shemitah. In the years 5774 (2014) - 5775 (2015)… we will have four lunar eclipses. With the number four there is always a fifth associated with the four. Therefore, with our four lunar eclipses we will see one solar eclipse between these four. Rabbi’s say that it’s like the four fingers of the hand, the thumb is like the four, yet it is materially different having only one joint rather than two and being opposable instead of inline. This teaches us that the solar eclipse is related to the lunar eclipses, yet it is materially different. 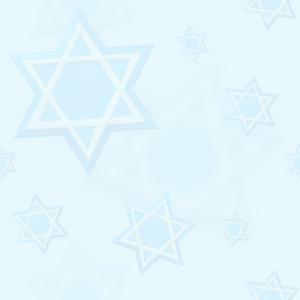 Jews have a (bracha) blessing for everything that brings benefit. No… they do not have a blessing for this event and therefore don’t say a blessing for an eclipse. The Hebrew word meaning for eclipse gives the answer away… "Likui" "defect." The Torah (first five Books of the Bible) states, that an eclipse ("Likui" / "defect") of the sun is a bad sign for the world; a lunar eclipse is a bad sign for Israel. Being associated with bad signs the eclipse was not assigned a blessing. The blessing said by the Jewish people after a "new moon, cannot be said during or after an eclipse as the moon is already "waning" at that point. The moon is associated with the children of Israel. Like the moon, the fortunes of Israel "wax and wane" sometimes there will be darkness and sometimes Israel will shine bright. Just as the moon waxes and wanes, so too does Israel go through stages of light and darkness with the constant knowledge that there is light at the end of the tunnel. For further information on the Blood Moons connected to the Feasts of the Lord... please see our article on "The Coming Blood Moons!" Copyright © 2017, PRAY 4 ZION (NPO 056-341). All rights reserved.